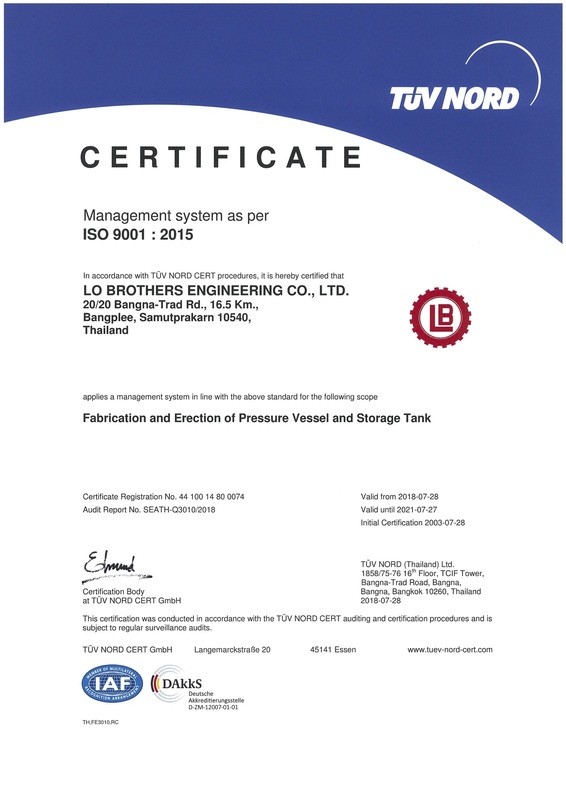 Established in 1964, Lo Brothers began providing process equipment such as API 650/620 metal storage tank, pressure vessel, reactor, silos, dished head and services to oil refineries and petrochemical. We then expanded to include chemical, power plant, pulp and paper, solid wood, electrical appliances, tire cords, food and other related industries. Presently, Lo Brothers capability has further extended to provide process design and supply of air pollution and waste water remediation equipment for instance, Wet Electrostatic Precipitators (WESP), Direct Thermal Oxidizer, Scrubber, Evaporator, Crystallizer and Heat Exchanger for all industries by providing state-of-the-art innovative process technology from Canada and USA. The company also enhanced its range of service to cover all aspects of clients' needs, from the stage of engineering, design, construction, sandblasting and painting to the final process of test-run and maintenance. Located on Bangna - Trad Road, Samut Prakarn Province, Thailand, Lo Brothers has been transferring up-to-date technology and machinery from overseas for the manufacturing of process equipment and high quality air pollution and waste water remediation equipment to solve air and water pollution containing VOCs, CO, SO2, NOx, odor and particles for all industries. Our capability including with supply of process engineering and energy optimization technology. We can provide fast and consistent service with reasonable prices for the design, fabrication, erection and after sale services. The company's high-quality standards are evident from its receipt of ISO 9001 certification for almost 20 years. Over fifty years of success and reliability, Lo Brothers has carried out wide variety of work and supplied diverse quality equipment to satisfy clients' demands.